Step one to ensuring your facility delivers positive patient outcomes, maintains regulatory compliance, and achieves financial viability in the New PDPM World is to perform a RUGs-to-PDPM Crosswalk on all your patients. A RUGs-to-PDPM Crosswalk allows providers to see where patients (and their related patient days) land in the new PDPM groups, and thereby, estimate new Medicare A reimbursement in both aggregate and individual PDPM rate components (nursing, NTA, rehab). This information is critical for both the provider and rehab partner as PDPM care delivery models and pricing proposals are considered. Unlike RUGs, PDPM will no longer prescribe or determine Medicare A payment based on therapy minute thresholds. Instead, the PDPM system sets reimbursement based on patients’ clinical characteristics determined by many coding and assessment scoring factors. Patients formerly classified under a RUGs rehab category (based on minutes) may or may NOT be mapped into a PDPM group that pays for as much therapy as the patient received under RUGs. Because of this fundamental change in how rates are determined, the crosswalk serves as a vital tool in understanding payment, volume and affordability of services under PDPM. Provider A and Provider B are in the same market and share the same RUGs patient day mix. Specifically, each experience an 85% Ultra High Rehab distribution on total Medicare A days. 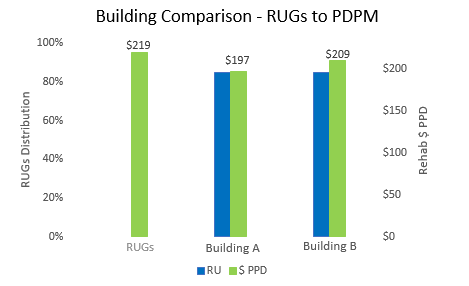 A RUGs-to-PDPM Crosswalk illustrates how different the two Providers’ comparative rehab payments per patient day are under PDPM as a result of the PDPM group mapping of each Provider’s patient population. The results are eye-catching. Under PDPM, Provider A will receive $12 less (rehab component) per Medicare A patient day than Provider B even though they received the same RUGs rate. In its impact file analysis released earlier this year, CMS estimates 60% of SNF providers will receive a net positive change in Medicare A reimbursement under PDPM. The majority of the balance of providers experiencing a net negative change in reimbursement will suffer less than a $100,000 annual reduction. It’s worth noting that the higher a provider’s Ultra High patient day distribution percentage is under RUGS, the greater correlation to a negative rate impact under PDPM. In fact, CMS outlined in the PDPM final rule an estimated 8.4% average reduction in reimbursement for patients classified as Ultra High under RUGs. Where your facility lands on this spectrum depends on how your patients map across to PDPM. The implications of these new PDPM payment dynamics are broad and important. What’s the best therapy pricing method under PDPM to align incentives? How do I ensure my patients receive the right amount of therapy for positive outcomes? How much therapy staff and minutes am I able to afford based on the patients’ clinical characteristics and respective PDPM group payment rates? How do I ensure I still meet compliance requirements under PDPM, a “managed care like” capitated system? 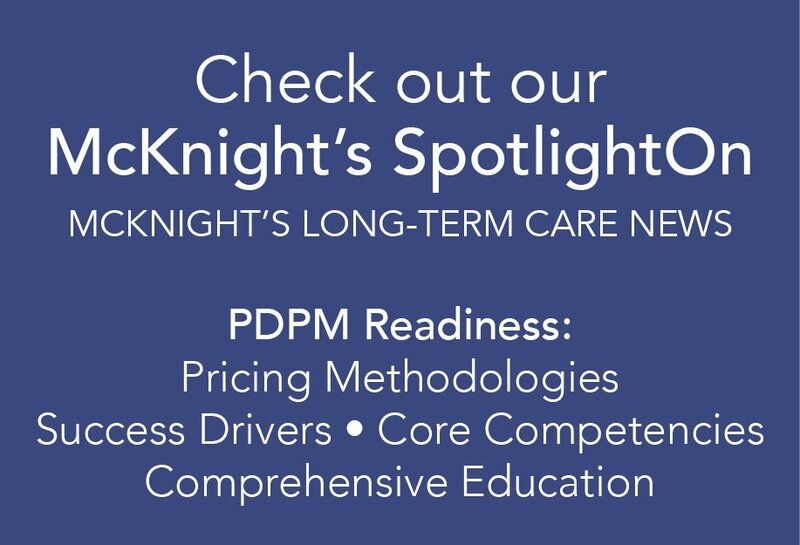 Bottom line: Knowing which PDPM groups patients land in – and the related reimbursement for each – is key to making informed decisions in light of new expectations with PDPM. Do Minutes Still Matter Under PDPM? Yes, just in different ways! To accomplish these critical steps, a PDPM crosswalk should be performed in order to set the stage for informed care delivery and pricing discussions. If you are being presented with an overly simplistic, gut feel pricing approach, you should know there’s a strong likelihood that either you or the rehab provider may be taking on unnecessary and uninformed patient care, compliance and/or financial risk. While there are many “simple” patient level PDPM calculators available online, their value is limited to a single patient’s situation. On the other hand, Crosswalk Models which aggregate all the provider’s Medicare A patients at once do exist. These models produce a comprehensive and efficient view into the new PDPM patient day distributions and related reimbursement impacts. A few EMRs have released crosswalk models which, when accompanied with MDS data, provide excellent analyses. Providers are encouraged to contact their EMR companies and/or rehab partners to determine current and future crosswalk capabilities. Take the first step. Initiate your crosswalk processing efforts now to position your facility for thoughtful and informed rehab discussions in the future. At HealthPRO® Heritage, we’re supporting our clients with Crosswalk Modeling and sophisticated PDPM readiness strategies already! Contact us if you need help! What is your current PDPM Plan? Who is on your PDPM Task Force? How are you getting your PDPM information? What worries you the most re: PDPM transition? Who are the leaders in the industry tackling PDPM? Will you start your crosswalk analysis now to position your facility for thoughtful and informed rehab discussions in the future? HealthPRO® Heritage is a trusted, consultative partner leading the industry in PDPM readiness. Our deliverables: Strategy, education & execution on key clinical competencies that are crucial to PDPM success.